You can have those cheap calls to Belfast you’ve been looking for. Catch up with your family and friends for less. 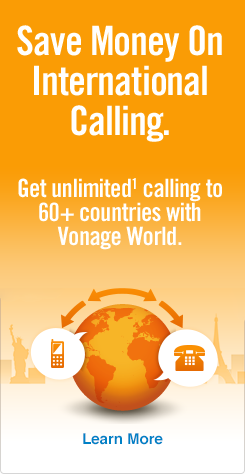 When you sign up for Vonage World®, you’ll discover there are virtually no limits to how long you can talk for! That’s because unlimited¹ calling to UK landlines is available anytime you want when you’re a Vonage customer. We send you a Vonage BoxTM, you connect it to your high-speed Internet service, and you’re on! If trying to reach a mobile phone when calling Belfast from USA, you still can, and only for a very low per-minute rate. You can also enjoy unlimited¹ calling to landlines in over 60 countries and mobiles in more than 10 countries. That’s the skinny on our top plan, but what about the actual process of how to call Belfast? Then, dial 28 — the Belfast area code (landlines only*). Complete dialing with the local 8-digit Belfast phone number. *Don’t forget that you’ll have to dial slightly differently than you would for a landline. Dial the US/Canada exit code as per usual, then the UK country code, and lastly a “7” before dialing the 9-digit mobile number. Belfast might not be the only locale on your mind. For help with other UK cities there’s a great how to call the UK from the US guide we put together. Click that link and read on. So we talked plenty about the cheapest way to call Belfast, but what about the actual city? Well, Belfast is the capital of Northern Ireland and was once the shipbuilding center of the UK. In fact, the RMS Titanic was put together in the city’s shipyards. Belfast has also proudly maintained its status as Northern Ireland’s cultural heart. If you’re visiting, you can take in a show at the outstanding Lyric Theatre, the stage upon which Liam Neeson got his start, or just walk along and enjoy the gorgeous Victorian architecture. You’ll never be bored in this charming, history-steeped capital city!